Foreword by Tony Cartalucci: This presentation is taken from Thailand's Government Public Relations Department and describes the King of Thailand's Sufficiency-Economy and his "New Theory" of economics. For free people around the world, they will recognize the concepts and goals as self-sufficiency, self-reliance, and true, genuine sustainable development. It can scarcely be argued that we all wouldn't be better off being as self-sufficient as this project aims at getting the Thai people. As America and Europe collapse under unsustainable Ponzi-schemes, perpetual war, foreign meddling, and an addiction to credit and socialist handouts, we are provided by the King of Thailand a more sane, third way - a middle path to take between crushing Malthusian austerity and reckless, exploitative expansion. A constant reminder of the King's concepts can be found on the back right side of every 1,000 baht banknote where a woman tending her garden is pictured with the concept described below in simple terms. Of course, with Thailand's latest elections and a full-fledged globalist-stooge now clawing his way back into power, the Wall Street Journal has already written an article calling the "sufficiency economy" a "relic of the past," and is hoping that Thaksin's new proxy government will remove such obstacles to growth and joins hands with globalization. This passage is long, but it is well worth the read if you have any interest at all in building a national model upon the foundation of self-sufficiency with the family and local community as society's basic building blocks. For a condensed guide concerning this topic, please see "Self-Sufficiency: a universal solution to the globalist problem." It has been more than half a century since His Majesty King Bhumibol Adulyadej ascended the throne as the ninth monarch of the Royal House of Chakri. All through these years, His Majesty has devoted his time and energy, working alongside his subjects in remote areas in all parts of the Kingdom to improve their living condition and livelihood. No place in the Kingdom is too remote, nor is any task too difficult for him. Large and small projects have been initiated by His Majesty, aimed at economic and social development, as well as the conservation of natural resources and the environment, with the people's well-being and happiness as the goal. r> His Majesty's development projects are based on morality, true knowledge and understanding of the situation, the expertise and experience of the society and communities, scientific studies, local wisdom, and appropriate technologies. His principles have been simplicity, frugality, and effectiveness, with all projects tailored to meet the needs of localities and solve problems at their root causes, laying a firm foundation for the prosperity and happiness of the people in all parts of the country. Since 1973, His Majesty the King emphasized in his royal addresses and speeches on various occasions development guidelines based on sufficiency, moderation, economizing, rationalization, and the creation of "social immunity" for the majority of the people who are in the farm sector. He cautioned the Thais not to be imprudent in conducting their lives, but to be fully aware of the development process in accordance with proper theories, and within the framework of good morality. This has become known as "Sufficiency Economy." "In fact, I have often said… to be a tiger is not important. The important thing is for us to have a self-supporting economy. A self-supporting economy means to have enough to survive." Thailand was then in a deep crisis, following the economic meltdown, resulting in mass unemployment and indebtedness, with great consequences for the lifestyle of the Thai people at that time. "The crisis occurred because we expanded our production too much, with no buyers, because no one could afford to buy." His Majesty implied in his speech that the export-oriented economy left Thailand in an imbalanced situation without self-sufficiency. For Thailand, the 1997 economic crisis served as a costly lesson of unbalanced and unstable growth, partly due to the improper economic and social development process, in which the economy relied heavily on foreign capital inflows and external markets. The production sector was export-driven, aimed at earning foreign exchange. As a result, farmers in certain areas had to buy rice for consumption, although they grew rice. Fundamental structures in the country remained weak, with no immunity for the vulnerable. Accumulated economic and social structural problems culminated in unfair distribution of capital, income, and growth, a decline in moral and cultural values, and the deterioration of natural resources and the environment. "When people talk about solving the current situation, the current crisis, one of the things they talk about is "globalization." We say that we are now in the age of globalization, and we must "comply" with it or follow the rules. If we fail to comply with what we committed to, others will be dissatisfied. Why? Because they are also in crisis. And we would find it more difficult to recover from the crisis. Not only countries in the region are affected. Even prosperous and stable countries are in trouble. This is because, if a crisis is not solved in one corner of the world, other parts are also affected. So we must try to support the people, providing them with jobs, so that they earn an income and can survive the crisis." Thailand is situated in a region of the world that is rich in biodiversity. The land is abundant in food crops. Since time immemorial, residents have earned their living with cultivation, thriving on the abundance on land, in the sea, and in the rivers. His Majesty the King is aware of the fact. He advised a self-supporting lifestyle for everyone. Farmers should be able to feed themselves, starting with rice production. Enough rice should be grown for household consumption, with the excess harvest sold to raise income. They are also advised to change from planting a single type of crop to integrated farming. People living in the city who are engaged in business should know how to invest appropriately, starting from small businesses. Apart from self-sufficiency, he has prescribed perseverance and industriousness. Also, people should be compassionate towards one another. His Majesty the King has attached great significance to soil and water, the two essential elements in agricultural development. There are about 2,000 royally initiated water resource development projects spread across the country. They clearly represent His Majesty's emphasis on fundamental infrastructure for the people's livelihood, to sustain their lives and bring them prosperity. From his first nationwide visit to the people in all regions early in the reign, His Majesty made direct contact with his subjects, inquiring about their living conditions, examining his maps, taking pictures, and taking down copious notes himself. It is a known fact that "There is no place in this land not visited by His Majesty the King." In the course of his visits to people in the rural areas, His Majesty reckoned that a large number of his subjects were not able to support themselves. He was determined to make them self-sufficient, so that they would be better able to contribute to national development. 1. Rice is a sturdy plant. With sufficient water, more yields can be obtained. 2. If rainwater can be stored for crop planting, better harvests can be achieved. 3. The construction of large reservoirs is becoming more and more difficult, because of the expansion of communities and the limited land area. 4. However, if each household has its own pond, the combined stored water can match that of a large reservoir, involving less investment and directly benefiting the local people. The hard-working monarch, who had intimate knowledge of the people's problems and had been advising those in the agricultural sector, who made up the majority of the population, spelled out the "New Theory" in his Sufficiency Economy philosophy. "Then I asked the villagers in the neighborhood about the past year. They said that they had got in the harvest and pointed to a heap of rice. We went in for a closer look. The rice had grown well but did not produce many grains, only about two or three to an ear. The production could be estimated at about one bucket or less per rai. On inquiry, the villagers explained that it was due to lack of rain. They had sown the rice, but when it came to transplanting the seedlings, there was no water. They had to make holes in the sand and stick the seedlings in them. In the daytime the plant withered and drooped, but at night it straightened up with the dew. In the end it developed ears but not so many grains of rice. That was a very revealing lesson, and they spoke to us very straightforwardly. This is proof that rice is a very rugged plant, able to survive with just a little humidity from the dew. Although that was ordinary rice, not upland rice, it could survive. If we could give only a little help, there could be an improvement and the people could survive. The project to be done need not be a big one to meet with success. It could be a modest project. So it dawned on me that in such a place rainfall is not small, but it just did not come at the right time. When it rains, it is not needed; when it is needed, it does not rain. So rice is not plentiful." His Majesty the King initiated the Cattle and Buffalo Bank to solve problems of farmers who had no buffalos for farming, or rice price guarantee in the form of a Rice Bank. When they faced drought, he introduced artificial rainmaking. They lacked rice milling facilities, so he set up the Royal Rice Mill. His Majesty experimented with rice growing within the Chitralada Villa, to obtain good rice breeds for farmers. More importantly, he had the Royal Plowing Ceremony revived after it was discontinued since the changing of the administrative system in 1932. This was meant to boost the morale of rice farmers. This Sufficiency Economy has long been introduced to help farmers, as His Majesty knew intimately their problems. "So in that area, there will be a new type of development, known as the "New Theory," which is believed to be carried out successfully here." 1. Firstly, the theory applies to small farmers holding about 15 rai, or about six acres, an average cultivation area for Thai farmers. 2. Secondly, farmers must be able to support themselves adequately. They must also realize the need for unity and compassion in the community so as to support one another. 3. Thirdly, each farm household should be able to grow enough rice for its whole year's consumption, under the assumption that each family can be self-reliant by growing rice on an area of five rai. 4. Fourthly, water must be available even in the dry season, averaging about 1,000 cubic meters per rai the whole year round. According to the New Theory, the average family's 15 rai of land will be divided into four parts in a ratio of 30:30:30:10. The first 30 percent, or 4.5 rai, is meant for a pond to support cultivation. A pond about four meters deep holds up to 19,000 cubic meters of rainwater, for the whole year's crop cultivation. The pond may also bring in additional income from aquatic animals and plants. "Raising fish provides additional income. With fish culture, earnings are gained within a few months." The second and third parts, 60 percent of the area, are for crop planting, 30 percent for rice and another 30 percent for cash crops, in accordance with the soil condition and market demand. Based on his calculation of the need for water at 1,000 cubic meters per rai in the dry season, the cultivation area that makes up the second part, 9 rai in all, would need about 9,000 cubic meters of water. He also took into consideration the evaporation of water from the pond in the dry season, with the water level reduced by about 1 centimeter a day. With an average of 300 days without rain in a year, the water level in the pond would be reduced by three meters. Therefore, the pond must be large enough to ensure that there is enough water. The remaining 10 percent of the area, 1.5 rai, is set aside as the service area, for a dwelling, paths, ramps, a kitchen garden, and livestock pens. The New Theory is in fact a land and water management method for small farms in the natural condition, both in normal times and in crisis. The theory is clearly defined and can be implemented by farmers themselves by following the steps and procedures that have been set. The New Theory aims at tackling the problem of water shortages and the use of limited land for cultivation so as to produce sufficient food for consumption, and, if possible, for sale. Agricultural management in the New Theory has three phases. In the first phase, farmers strive to be self-sufficient by producing enough food for the family, living in a good environment, and enjoying good health, through the division of the land into the three zones described above. In the second phase, farmers are encouraged to organize themselves into groups or cooperatives to conduct various activities in coordination with related government agencies, foundations, and private enterprises, focusing on production, such as crop seeds and soil preparation; on marketing, in the form of silos, drying space, distribution, and rice-milling tools; on daily living, such as shrimp paste, fish sauce, and dried food; on welfare, such as health and loans; on education, such as schools and scholarships; and on social and religious affairs, such as community functions. With community members joining together as groups, they can reduce their dependency on external parties, while increasing their bargaining power in the acquisition of production factors and the sale of their produce. Costs can also be reduced in transportation and marketing through economies of scale. Production planning can also be done for the community for common benefits. 2. Development of better quality of life in various aspects, such as health, education, and social and religious activities. The third phase involves connections with other organizations and agencies concerning capital, marketing, and energy, to expand commercial activities with the setting up of rice-mills, community shops, and service stations. Farmers are thus provided the chance to learn and acquire experience in production, processing of agricultural products, marketing, and even exporting. In this way, farm families earn more income and live happily, and the community is strengthened. Farmers learn by doing at all steps, resulting in a sustainable form of development. 2. Development toward the Sufficiency Economy. In all three phases of the New Theory, support and cooperation from outside are needed, in a multilateral partnership for development, with full cooperation from all stakeholders, as participants and as beneficiaries. The procedure in the three phases is outlined in the diagram below. As seen in the diagram, the first phase involves small-scale implementation, with the emphasis on acquiring production factors and experimenting to achieve results. The achievement in the first phase implies earning enough for a comfortable living or for savings, before getting into the second phase, which involves expansion and integrated development, to enhance efficiency in management by organizing as farmers groups or cooperatives, to strengthen production and marketing, and improve living condition, welfare, education, and social and religious activities. The next phase involves advancement and institutionalization, leading to processing and adding value to the products in the form of agro-industrial development, in coordination with financial sources (commercial banks) and energy sources (oil firms). Taken together, the three phases cover the full cycle of development, resulting in a one-stop service center for farmers. The success in the application of the New Theory, meanwhile, hinges on three major factors: first, true understanding on the part of farmers in applying the New Theory to their livelihood; second, their readiness to take part in the activities and cooperative programs; and third, substantial cooperation and support from outside on a continual basis. The New Theory aims at self-sufficiency for farmers to a reasonable extent, in keeping with the overriding principle of moderation, the Middle Way. They are not meant to turn back to an ancient way of life, in which individuals provide for themselves in every aspect. Instead, farmers are empowered by means of producing enough food to sustain themselves, while benefiting from basic trading of produce and production factors to their full potential. They are encouraged to organize themselves as groups for enhanced bargaining power and efficiency in marketing and trading with outside parties, with mutual trade benefits. "By sufficiency, we do not mean that each family must produce its own food, weave its own clothes. That is just too much." "This Sufficiency Economy can be implemented for only half, not the entire economy. Even one fourth is good enough, not one fourth of the area, but one fourth of the action." This implies that the implementation of Sufficiency Economy need not cover the economy of an entire country, which is impossible. Should one family or one village turn to Sufficiency Economy entirely, it would be like taking backward steps to the Stone Age. Faculty members of the Faculty of Economic Development, at the National Institute of Development Administration, in 1999 conducted a study on the New Theory pertaining to economic development. The main thrust of the New Theory was shown to correspond with the theories of several thinkers and theorists in economic development in the West. The three phases of the New Theory, for instance, are interlinked as the progression in economic development from a subsistence economy to commercialization, in line with various economic development theories. Moreover, the New Theory corresponds with the theory of trade and economic development put forward by Myint (1958), which described the transformation from a subsistence economy to commercialization through the expansion of production from subsistence level to the production for sale or export outside the locality and the country, to distribute excess produce not needed for consumption. The New Theory concept of transferring resources to be invested in the building of water sources and a central water supply system to distribute water to farmers means the transformation of resources into capital for farmers, to increase their productivity, which corresponds with recent economic development theories that place the emphasis on creating economic growth in tandem with fair income distribution. Such a transfer of resources as "capital" for the poor may adversely affect national economic growth as a whole, but will contribute to fair income distribution in the long run, with increased productivity seen among the poor who benefit from the capital. The increase of capital for farmers in the form of water sources enables them to grow crops the whole year round, easing the problems of underemployment, disguised unemployment, and seasonal unemployment, while enhancing productivity on land for cultivation that is under-utilized because of a lack of complementary factors, particularly water, which prevent their limited land areas from being fully utilized. In the end, the productivity of the land and farm labor is enhanced as a result. The allocation of part of the farmland for the digging of a pond is a sacrifice of land for cultivation in exchange for water, an essential factor for agriculture. The digging of a pond represents an investment in water to replace the land. As a consequence, however, yields from the remaining land area can be doubled. Farmers can regulate water to ensure steady growth of their crops, reducing their dependence on rainfall. Surplus farmhands that became unemployed in the dry season would be able to find plenty of work all through the year, with the maintenance of the water pond, fish breeding, and plant protection and nurturing. Therefore, with existing land and labor, production can be increased and diversified, with enhanced quality and added value. Viewed from the perspective of social development, all three phases of the New Theory have social impacts on subsistence farmers who depend on rainfall and who have a number of farmhands in the household. As mentioned, the first phase focuses on production and crop diversification, with unity at local level, while the second and third phases add organization as groups and coordination with other agencies in the commercialization of production. Farmers thus have a better quality of life, and the community experiences sustainable development. A better quality of life is attained as farmers are in a better environment, so their health improves, and there are jobs the year round, in better and safer conditions, earning continuously and more. Their education is improved, the family unified, and the community strengthened. A sustainable type of development is the result, as it aims at self-reliance among farmers, a better environment, a strengthened community, and organization into groups for production, marketing, and welfare. The environment is improved with diverse activities, such as the planting of perennial trees and multiple and alternate crops, and the keeping of herb gardens and livestock. Diversification breaks the cycle of plant diseases and pests. Soil degradation is slowed down, and it is kept fertile from the canopy of perennial trees, whose fallen leaves and foliage can be turned into compost. Organic pesticides and fertilizers from herbal products are emphasized, replacing chemicals. Farmers' health is improved, both their physical and emotional health, as the family is kept together, without the need to migrate for jobs elsewhere. The family has enough food to last the whole year, with continuous earnings and higher incomes. The use of chemicals is reduced, so farmers work in safer and more stable conditions. Education is improved for farmers and their children, with the learning process in the program, through consultations among themselves, and news and information monitoring. The stable incomes also enable farmers to seek better education for themselves and their children. Farmers earn steady and higher income, resulting in a more equitable distribution of income. Under the multiple and alternating crops system, farmers can spread out harvesting time over the entire year. They can avoid risks from fluctuating prices, pests, and plant diseases. Production costs can be reduced as neighbors pitch in to work on planting or harvesting when needed, while resources are fully utilized, such as the use of manure as fertilizers. Chemical use is lessened, while more food items are produced for consumption. Household spending is thus contained and less borrowing is necessary. Farm families are kept intact and satisfied, as jobs are available in the locality the whole year round, without the need to migrate for jobs elsewhere. Family members also earn steady income, with more frequent harvests of produce. Food items are sufficient and diversified, resulting in healthy and happy families and communities, as shown in Diagram 3. The community is strengthened, as members are not forced to migrate for jobs elsewhere. Labor is constantly in demand the whole year round, in rice farming, crop planting, fish breeding, and livestock raising. Farmhands are efficiently utilized. They also make up a workforce for various community projects. 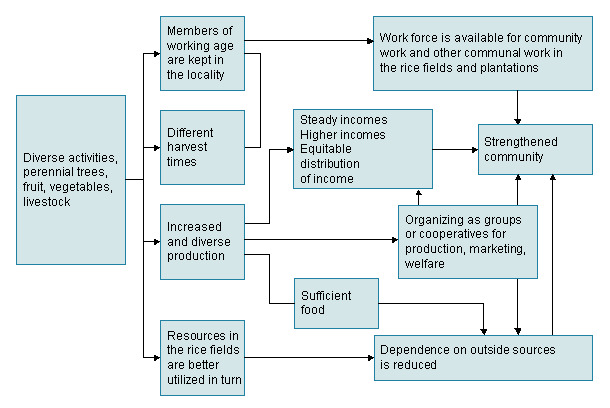 With steady farm incomes, sufficient food in the community, and organizations such as groups or cooperatives to improve production, marketing, living conditions, welfare, and capital, dependence on the outside can be reduced, with more bargaining power for the community, and a strengthened community, as shown in Diagram 4 below. The result has been sustainable development, as it shores up the economy and creates self-sufficiency, while the environment is improved and the community strengthened, with people organizing into groups for production, marketing, and welfare, for example. Such organization of people in the community not only makes it less dependent on outside sources, but also creates better bargaining power for the community in its acquisition of production factors and the sale of products. The cost of transportation and marketing can also be reduced, since it benefits from the economy of scale. At the same time, organized farmers can better plan their production, in accordance with market demands. In the third phase, thanks to coordination with other organizations in capital, marketing, and business operation on a wider scale, such as the setting up of rice mills, shops, and service stations, farmers are able to sell value-added products, at the same time learning and gaining experience in production, marketing, and processing. Their incomes gradually increase, and at the same time, the environment is improved and the family institution and the community are strengthened, resulting in sustainable development, as shown in Diagram 5 below. The New Theory puts a high priority on human resource development, under the principle of people-centered development, by means of empowerment by and for the people, comprising enhancement of people's potential and capacity-building for individuals. The process of participation in decision-making on development is encouraged, in tandem with the creation of an enabling environment, for individuals to utilize their potential for enhancing their opportunities and to have more options in life, along with the development of the quality of life. This has been summed up as the development of the people, by the people and for the people. 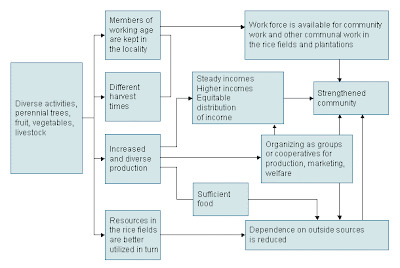 The development of the people, as farmers are given the knowledge and ability to increase their productivity, earning more income, such as from rice-farming, fruit-tree growing, and fish rearing, management of the market and improved administration as groups or cooperatives, with better bargaining power and extension of cooperation to energy and capital sources; the development by the people, because farmers adopt the New Theory of their own free will, and voluntarily expand the results of the development to strengthen the society from the grassroots, by attaining self-supporting ability; the development for the people, as in the objectives of the second phase of the New Theory, with the focus on the improvement of the living condition, welfare, education, social and religious aspects, and the third phase, which clearly defines the "development of the quality of life," yielding benefits to all sides. "In bringing about progress and prosperity, it is imperative to build up gradually, one step at a time, implementing measures, while contemplating and improving them. Never make the efforts with haste, spurred by the eagerness to bring novelty, just for the sake of novelty. In fact, nothing is really new. All the novelties are just the continuation of the old." "When the base is complete and firm, you can start developing further, building on that base, working, developing and improving at the same time." The underlying concept of the New Theory places emphasis on the learning process rather than the success of the program alone. Also, the New Theory is not a magic formula for success that can be applied in all places. In implementing the New Theory, farmers must start from a real understanding of the development process, to be carried out in steps. The main thrust of development is the unleashing of human potential, by means of promoting, supporting, and stimulating the learning process, with the development of knowledge, ability, and skills in their livelihood, and in their peaceful co-existence with others. This is governed by good morality and code of conduct, and with the awareness of a sustainable development, based on the conservation of natural resources and the environment. 1. Redesign of farming processes and resource management and mobilization, through the strengthening of the system and mechanisms in farming, and by seeking partnerships in development in both the public and private sectors. 2. Refocus on a farmer-centered development approach, through the enhancement of farmers' potentials, so that they can live comfortably with "adequacy" and "sufficiency." 3. Recapture of both contingency and situation, with the recognition of the top priority to eradicate poverty, as the means to strengthen the grassroots society of the country, comprising peasants' and farmers' groups. 1. The people will be in a position of self-sufficiency in agriculture, having enough to feed themselves, although perhaps not rich. 2. In any year when water is adequate, they will be able to plant their usual crops or their annual rice crop. If after that, in the dry season, water becomes scarce, they will be able to use the water that has been saved in the pond in their own plot of land to cultivate any crop or even a second rice crop. They will not have to depend too heavily on the main irrigation system because they have their own supply. Moreover, they may be able to plant vegetables or raise fish, or do other things. Therefore, the New Theory is not just meant for the prevention of water shortages. 3. In normal situation, farmers can get rich. 4. In case of floods, they can recover without relying too much on official assistance. 1. The Thai economy comprises two systems, the community economy and the capitalistic system. The community economy involves the livelihood of the majority of the populace, found in all regions of the country, especially in the provincial areas. The main feature of the community economy is that families and communities are the production units, with the objective of enabling the families and communities to be self-supporting. The production is therefore meant for household consumption, and then for sale to raise income for the family's survival, rather than to make maximum profits. The household is thus a small and independent producer, utilizing the available labor in the family on the existing land to feed the family, originally with rice-growing. Later on, with more family members on the limited land, crops that employ less space but more labor are resorted to, such as vegetables and fruit trees, or livestock rearing. They might also turn to providing services such as the repair and maintenance of farm tools and machinery. Members who sell their labor elsewhere also remit income to support their farm families in rural areas. Selling of labor is thus income earning, not the permanent change of profession. c. The manner in which the state and the capitalistic system deal with the communities, without managing the production, but benefiting from the excess produce from the villages. The maintenance of family and community economy in the past 50 years has been the adaptation and struggles of families and communities, by shifting from rice-growing to multiple crops, service business and trading, to preserve the families and communities. Such undertakings are individually carried out or as local networks created among relatives and friends, village to village, to broader confines. This represents the importance and strong ties of the family institution and the community in the Thai village economy. The direction of the nation in accordance with the real situation and aspirations of the Thai people should be led by community and community culture, because the community is the axis of the Thai society and culture, as the institution or the way of life of the majority of the Thai people. 2. The community's potential for the management of its own resources. 4. The proper size of the population. "If we contain our wants, with less greed, we would be less belligerent towards others. If all countries entertain this - this is not an economic system - the idea that we all should be self-sufficient, which implies moderation, not to the extreme, not blinded with greed, we can all live happily." The body of knowledge in economics and agriculture obtained from the New Theory granted by His Majesty the King to his people has been of great help to the country and the people in time of crisis, with diverse solutions to the people's problems, people-centered development initiatives, sustainable development based on self-reliance, full public participation in development, equitable distribution of natural resources, integration of spiritualism and materialism, connection between cities and rural areas, and ultimately the equilibrium in the roles played by all sides.